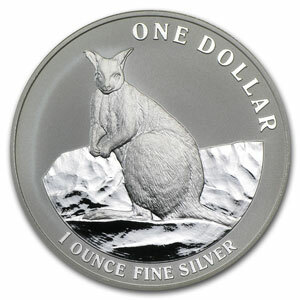 The Australian Silver Kangaroo is a 99.9% fine silver bullion coin. They are minted by the Royal Australian Mint, or RAM (an agency of the Commonwealth Government of Australia) in Canberry, Australia. Featuring the kangaroo, one of the country’s national icons, this coin is highly desired among coin collectors and precious metal investors alike. Read on for more information about the coin. The reverse of the coin depicts a kangaroo design by Horst Hahne. The obverse features Queen Elizabeth II in a design by Raphael Maklouf. The kangaroo design featured on the reverse changes each year, with many collectors purchasing each yearly issue of this coin in order to collect each new depiction of kangaroos. The instantly identifiable, charming kangaroo design has made this coin popular throughout the world. The standard for Silver Kangaroo coins is extremely high when compared with quality standards for the 1 ounce silver coins minted by other countries. Its mirror finish is particularly popular among collectors. The actual weight of this coin is 31.103 grams, or just over 1 troy ounce. Meanwhile, the American Silver Eagles, and many other international silver coins marketed as 1 troy ounce, actually contain slightly less than 1 ounce of silver. As a result, the Australian Silver Kangaroo is considered to be one of the best values available in 1 ounce silver bullion coins. Introduced in 1993, this coin has a 40mm diameter. There are two forms of the coin issued each year: a proof coin (since 1998) and a frosted uncirculated coin. Versions with gold plating have also been produced beginning in 2003. For 2013, the twentieth anniversary of this popular series, the Royal Australian Mint has minted a 1 ounce proof silver coin featuring the original design from 1993. To celebrate the long-running Kangaroo Series, this commemorative coin features a bounding kangaroo design by Horst Hahne. Just 5,000 such coins will be minted during 2013. When compared to other popular government-minted silver coins such as the American Silver Eagle and the Canadian Maple Leaf (each minted in the millions), the Australian Silver Kangaroo is minted in much smaller quantities, increasing its rarity. Each year, less than a hundred thousand silver kangaroos are minted. In 2009, for example, 20,000 uncirculated, 20,000 proof, and 12,500 gold-plated silver kangaroo coins were minted. This silver bullion coin is legal tender within Australia, and has a face value of $1 AUS, though its full market value is many times this amount. This is one of the only legal tender bullion silver coins to undergo a design change annually. Because of the limited mintage and frequent design changes, Australian Silver Kangaroo coins from previous years typically command a premium over newer issues. Unlike many other bullion coins, the price of backdated Australian Silver Kangaroos is not closely tied to the current spot price of silver. Instead, it is based on numismatic value and rarity. Backdated coins are notoriously difficult to find, particularly the 1998 issue proof coin, and frequently command a price that is significantly higher than the current price of silver.